This photo was taken on October 20, 2012 at 1:33 pm. The location was in Alexandria, Virginia. The "Take It!" came from one of those moments when hearing a loud noise - looking to find the source if possible. Not only was the creation of this noise visible - but was front and not quite center on this great looking court house. 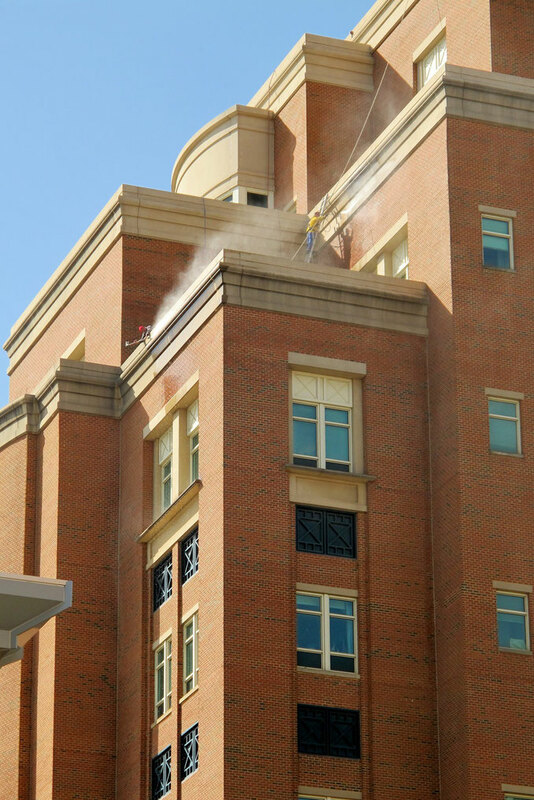 I have rarely seen a building get a scrubbing - but this one was getting its top edge cleaned. The overspray almost seems to follow the corner which is part of the fun of this photo. The After Take: This picture seemed to gather impact as I showed it to people. That there are so many right angle edges both forward and recessed be came a big part of the strength of the photo. Simple in shape but made a bit more complex by the multitude of them. That the sun was at just the right position to cast shadows off the edges made it even more impactful. Here is hoping there are similar programs where you live to keep buildings in good shape. We see so many pictures of cities where there are not provisions for this that viewing this was refreshing. Thanks for joining us for the current photo presentation. You are cordially invited to return Tuesday, December 25th for a new picture that we hope you will enjoy. Haha, Looks like you got one last image in before the end. Glad I was able to log in and see it before heading to, potentially, my last day of work. I kid of course. I would not be able to do that job, I have a very real fear of heights. I give credit to that man, he is braver than I.
Wow, is that a guy popping his head over the edge there? That is crazy. I could not do that job either. Horrifying. I would think slipping would be a constant source of paranoia as well. The surface has to be pretty wet. I bet the view is pretty cool. I wonder if they ever bring Binoculars.